Land Area: 10081 sq. ft. Floor Area: 2544 sq. ft. This unfurnished, 3 bedroom, 1.5 bathroom 2,544 sq.ft. home is located near to Stewarts Hill and Massiah Street in the parish of St. John. The upper level offers 1,440 sq,ft of living space while the lower level offers 1,104 sq.ft. Perfectly positioned are the three bedrooms which are on the Eastern side of the property thus taking advantage of our beautiful cool breezes. The Master measures 13.7’ x 14.9’, has a built in closet and an interconnecting door with the second or middle bedroom which measures 11.11’ x 13.7’ which also has a built in closet. The final or third bedroom is towards the North-east of the property, it measures 14.10’ x 13.7’ this one also has a built in closet and a corner basin in the bedroom. Conveniently located towards the rear of the property is the separate bath, water closet and sink. The sizable kitchen measures approximately 150 sq.ft or 10.9’ x 13.7’ and is centrally located, it has built in cabinetry and a “back door” by the rear steps – the kitchen has a window opening into the dining room making it very convenient when entertaining. The dining area flows through an archway which was the style of the day, then into the comfortable living room offering two double paneled glass doors which open onto the spacious wraparound patio with formal stairwell to the yard and gardens below. The lower level or downstairs of the property is accessible via stairs next to the kitchen and also four additional doors on ground level making this space convenient from various points of the perimeter of the property. Being currently used for storage it offers three sizable rooms measuring, 22.11’x14.4’, 22.01 x 14.4’ and 22.9 x 13.10’ with a ceiling height of approximately 7.4’. This level also has a powder room and two traditional trough type sinks. The rear of the property is enclosed and has plenty of storage space and additional parking for three cars or more. There is the remains of a further structure which can be converted into another storage shed should that be needed. Located near the new neighbourhood of Rosegate Meadows, the property is on a bus route, it is a 10 minute drive to Six Roads and its amenities including Doctors’ Offices, banking, shopping and restaurants and The Lodge School is within walking distance. This unfurnished, 3 bedroom, 1.5 bathroom 2,544 sq.ft. 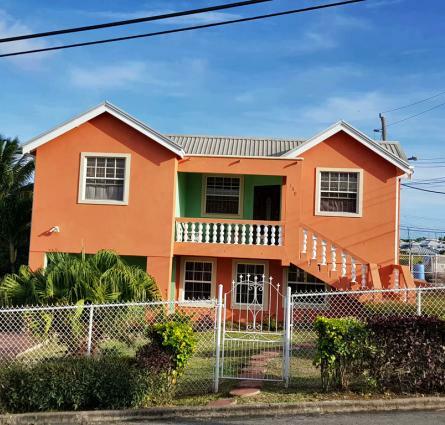 home is located near to Stewarts Hill and Massiah Street in the parish of St. John.